“Once in a blue moon” is not just a phrase we use for those occasional treats or chores, but it is also a rare statistical quirk which occurs when a full moon occurs twice in a calendar month. 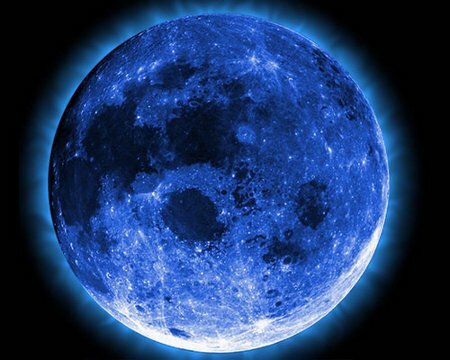 Sadly, the moon is not going to turn blue, and indeed the reason why we call it a “blue moon” is lost to history, although the Farmers’ Almanac would always note an occurrence during the 18th century. Regardless, today, Friday, August 31, will be the first “blue moon” since March 2010 and there will not be another one again until July 2015 – so it’s time to get on with that list of things to do. With a full moon occurring once every 29 days, and a month topping out with a maximum of 31 days, the combination is a rare one – occurring around once every two-and-a-half years. Sadly, we cannot expect the moon to take on a different hue. Barring volcanic eruption, it will remain as white as ever, unless clouds obscure the view. If a volcano does erupt, then all bets are off, as ash in the sky has been known to play visual tricks with the sun and the moon. When Krakatoa erupted in Indonesia in 1883 – where ash soared right into the upper echelons of the atmosphere, blue moons were reported around the world, for up to two years. Krakatoa’s ash is the reason. Some of the ash-clouds were filled with particles about 1 micron (one millionth of a meter) wide – the right size to strongly scatter red light, while allowing other colors to pass. White moonbeams shining through the clouds emerged blue, and sometimes green. Blue moons persisted for years after the eruption. People also saw lavender suns and, for the first time, noctilucent clouds. The ash caused “such vivid red sunsets that fire engines were called out in New York, Poughkeepsie, and New Haven to quench the apparent conflagration”, according to volcanologist Scott Rowland at the University of Hawaii. Other less potent volcanos have turned the moon blue, too. People saw blue moons in 1983, for instance, after the eruption of the El Chichon volcano in Mexico. And there are reports of blue moons caused by Mt. St. Helens in 1980 and Mount Pinatubo in 1991. According to NASA, the key to a blue moon is having in the air lots of particles slightly wider than the wavelength of red light (0.7 micron) – and no other sizes present. This is rare, but volcanoes sometimes spit out such clouds, as do forest fires. Physics professor Sue Ann Bowling of the University of Alaska said: “On September 23, 1950, several muskeg fires that had been quietly smoldering for several years in Alberta suddenly blew up into major – and very smoky – fires. “Winds carried the smoke eastward and southward with unusual speed, and the conditions of the fire produced large quantities of oily droplets of just the right size (about 1 micron in diameter) to scatter red and yellow light. “Wherever the smoke cleared enough so that the sun was visible, it was lavender or blue.